When Anki invited us by the office last week to check out their latest creation, we weren’t sure what to expect. In the eight years since the company was founded by a trio of Carnegie Mellon graduates, it’s offered up a handful of distinctly different smart toys, from its Drive smart cars to 2016’s Cozmo robot. The truth is that the company’s latest creation looks an awful lot like its last. In fact, the only immediately apparent change is a dark coat of paint, akin to what the iMac received when it graduated to the iMac Pro. In fact, that’s probably a pretty solid analogy, beyond just the color change, so let’s stick with that. Simply put, Vector is Cozmo for adults. In many ways, the new ‘bot is built on the lessons learned from Cozmo, coupled with more advanced internals. Vector has ~700 parts — double the number of its predecessor, while its brain is a much more advanced Snapdragon processor. Vector’s face also features a higher res display, making it capable of expressing subtler emotion redesigned by that staff of ex-Pixar and Dreamworks animators the company employs. So, what does all of this add up to, exactly? The company certainly has some grand ambitions. Anki believes it’s well-positioned to offer users the gateway to the next generation of home robots. Both R2-D2 and Rosie from the Jetsons are casually name-checked in the company’s press release, naturally. The truth about Vector is more modest, though the product does seem like a much more mainstream solution than the recently departed Kuri. For one thing, it will run less than half the price, at $250. That’s still $70 more than Cozmo, mind you. Unlike Cozmo, however, Vector doesn’t require a constant smartphone connection — just Wi-Fi — which is part of why having a more advanced on-board computation system is important. 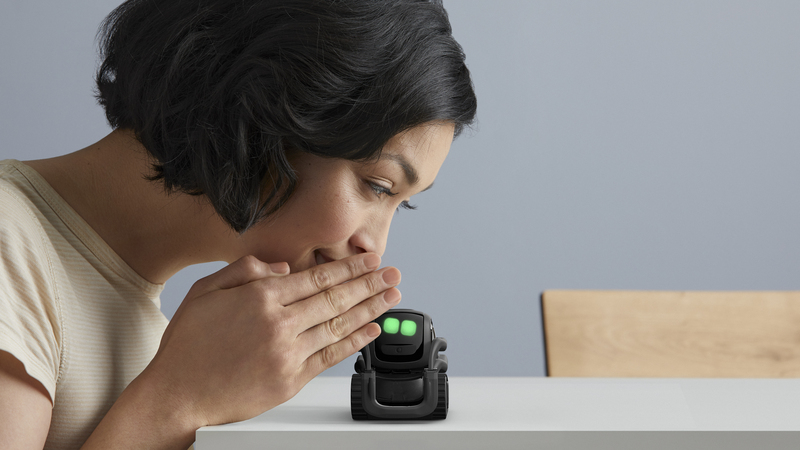 Along with that, Vector also gets an HD camera with a 120-degree field of view, so it can double as a roaming security device (that functionality is coming next year), and four microphones, which allow it to Alexa-style commands with a “Hey Vector.” Like Cozmo, the robot will also initiate conversation when you make eye contact, so you don’t have to summon it ever time. Instead of opting for Alexa or Google Assistant, however, the company used third-party knowledge graphs to build its own system, so Vector doesn’t break character by launching another assistant. Like Cozmo, I suspect the company’s got a lot planned for the robot by way of software updates. For the time being, however, I haven’t seen a lot that convinces me that Vector’s much more than a slightly more advanced Cozmo — which could make the pricey robot toy a hard sell for serious adults. Broader ambitions should include a robot that can traverse more than the limited range of a desktop in order to better patrol the home. iRobot’s upcoming smart home plans for the Roomba serve as a potential way forward for home robotics, though Anki believes that it has the upper hand here by investing a good deal in personality from the outset. Perhaps people really do need that human-to-robot connection to really entrust their lives to such a device, though a compete lack of personality certainly hasn’t hurt Amazon’s Echo or Google Home. But Anki gets the benefit of the doubt here. This is all very early stages, and our early skepticism about Cozmo being a niche product was put to rest when the company managed to sell “hundreds of thousands” globally. Launching as a Kickstarter campaign should also help Anki assess early interest in the product and scale from there. I remain skeptical as ever that Vector is the mainstream home robot of the future — it seems more of a stepping stone, really. And certainly Anki is being transparent about its job of constantly building on the learnings of past models. At the very least, the company’s got the interest, revenue and funding to avoid the recent pitfalls of Sphero and Kuri.